Utility gear is taking fashion by storm. In the high fashion world, we often see collections based on whimsy and hyperbole. A reimagining of style through a tactical lens has shifted recent high fashion statements to the practical. Inspired by futuristic technology, military style and outdoor wear, contemporary design focuses on industrial themes and utilitarianism. Modern staples take on utility gear including lightweight synthetic textiles, straps, pockets and metal accents. In the “FM-2030” CASE #R000 collection from C2H4, futuristic design elements are meant to transport the wearer to the year 2030. The cool-toned color blocking and synthetic materials create the uncanny sensation of surrealism. Alyx’s 1017 9SM SS19 collection was a revelation in techwear and industrial inspiration. The bright unorthodox fabrics, surgical style face mask and shoulder bag embellished with the authentic Alyx rollercoaster buckle are a perfect example of the brand’s creative vision and prowess. The Heliot Emil SS19 collection featured a mix of durable waterproof fabrics like nylon and polyester. This look includes chest pockets, two silver carabiners fastened tightly to a polypropylene strap belt, and a lightweight jacket hanging from the waist for layering. This look from Heron Preston’s Spring 2019 runway show provided a utilitarian stunt. In black leather, shoulders adorned in thick straps, the model held a hard-sided orange briefcase along with a bright orange waist bag for dual storage, not to mention the black and orange glasses. A-COLD-WALL’s SS19 collection played with deconstructed shapes and reflective materials. A clear plastic turtleneck sharply angles the shoulder while thick metal wiring connects an asymmetrical nylon sleeve to the right arm. Zipper embellishments heighten the imminent sense of industrial whimsy. Off-White’s Men’s SS19 collection embodies utility with pockets galore, military style pants, a full-zip blue shirt and a shoulder bag with large black straps. The ‘chest rig’ can be attributed to a 1999 Miu Miu collection but has recently been revived by countless high-end fashion designers. This chest rig is a vintage Prada piece. If you don’t have money to blow, recreations of the chest rig can be found at more affordable online stores and brands. The thick wires clipped to the pocket of the long black jacket form a curve creating an abstraction opposite in design from the streamlined black utility pants. Designer Samuel Ross creates a sort of meta-industrialism here, making hard materials create ornate flowing shapes. Wires, carabiners, large-link chains and other metallic accents in an outfit are flags of the utilitarian trend. The Alyx Hero Chain from the 1017 9SM Collection exemplifies the industrial trend for large-link chains in any outfit. This piece also includes a small version of the popular Alyx rollercoaster buckle–the bold metallic clasp that the high fashion industry has seen recreated by many other brands recently. 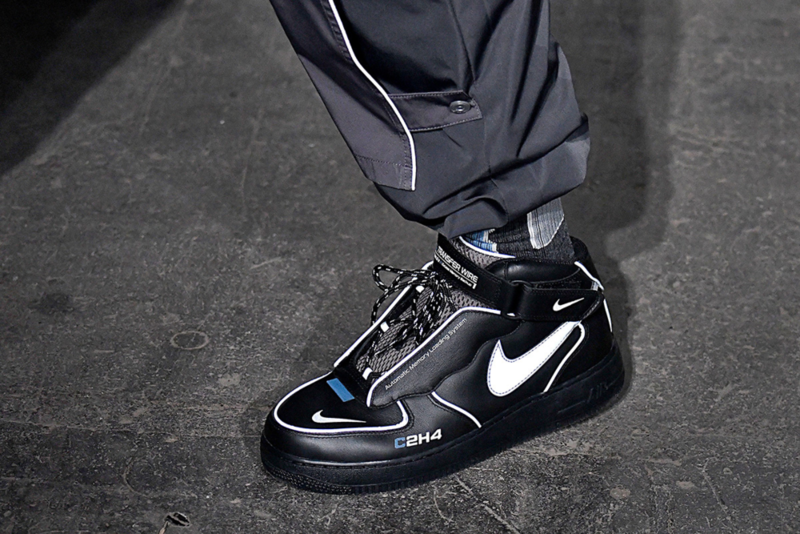 C2H4’s AW19 show featured the brand’s own take on the classic Nike Air Force 1 Mid. Notice the fluorescent white lining, blue accents, and unique lacing system over an underlying mesh panel. The Alyx Red Chelsea Boot is bright and textured. In a metallic red sheen, these boots are beautiful by themselves but can be hardened with a detachable rubber sole that fastens around the toe and heel. This leather boot was featured in the Dior Men’s Pre-Fall show with rollercoaster buckles from Alyx 9SM that say ‘DIOR’ in white lettering. Prada men’s sneaker Fall 2018: the straps and industrial lining patterns provide a streamlined but colorful look for this piece of footwear art.